A southbound train on the orange line. Welcome, readers. This webpage is my ongoing project, designed with the hope of informing metro Atlantans of our transit system. 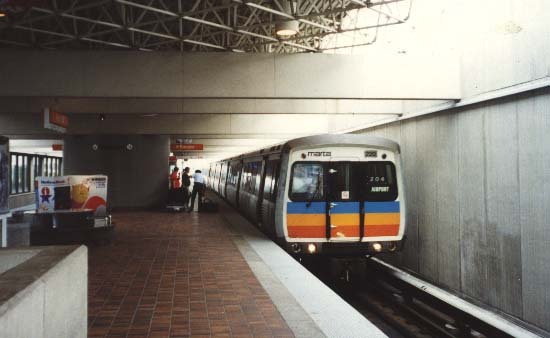 The Metropolitan Atlanta Rapid Transit Authority, the common name of which is the acronym MARTA, has been operating buses in Atlanta since 17 February 1972, and a two-line metro system since 30 June 1979. Nationally it is ranked within the ten most heavily utilized metropolitan transit systems, and has been named the safest in the United States seventeen times. Why ride MARTA, then? It may not even operate where you work, say, the suburbs outside of Fulton or DeKalb County. I personally have found it to be a lifter of anxiety when going most places within those two counties, MARTA's area of operation. At one time I admit to have strictly patronized the system to lend it my own limited financial support; lately, however, I have grown more than a little weary, and oftentimes downright scared, of driving the busier roads within twenty-something miles of the city center. Obviously this is only my own perspective, but others are beginning to catch on, although not exactly everybody at once. Decided to step on? Browse the bar to the left if you want to learn about using MARTA. This site is in no way affiliated with the Metropolitan Atlanta Rapid Transit Authority.